During the Park Advisory Board’s quarterly meeting on Oct. 19 at the Palisades Recreation Center, members discussed imperiled trees and expanded parking for the eventual Potrero Canyon Park. A PREMAP committee (Palisades Recreation Center Master Plan) was formed several years ago to address needs and oversee development at the Rec Center. 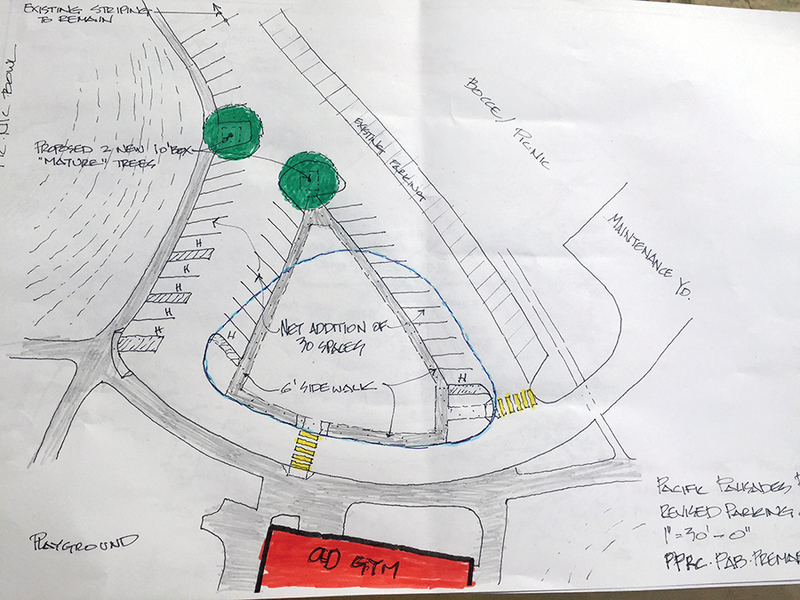 One member, Gustav Soderbergh, the founding principal of Van Tilburg, Banvard & Soderbergh, an architecture, planning and urban design company, presented a plan to add 30 parking spaces to satisfy requirements for Potrero. In January 2008, the Potrero Canyon Citizens Committee presented a plan to the city that endorsed a passive-recreation park (with one main hiking trail and no playing fields), all the way down to PCH. Additionally, after numerous community meetings and with feedback from residents, the committee nixed any additional parking at the bottom of Potrero, which meant that more parking had to be added at the Rec Center. The California Coastal Commission has asked for an additional 10 to 30 spaces as a condition for constructing the park. The blue circle is the existing island in front of the old gym. A new design would be more triangular in shape and allow for additional parking spaces and crosswalks at the Recreation Center. Initially, some parking spaces were going to be cut into the round island in front of the gym, while allowing the five existing pine trees to stay in place. Nobody dared suggest cutting them down. But, weakened by the prolonged drought, five stone pine trees died and had to be cut down earlier this year. This enabled Soderbergh to rethink the island, turning it from more of a circle into a triangle. His plan now provides additional parking spaces, a sidewalk (with crosswalks), a place for two mature trees, and benches will offer a safe place for kids to wait for rides. PAB approved the revised plan, which will go to the city for approval. The construction will be paid for out of Potrero Park funds. Lee Trask, another member of PREMAP, discussed how the drought and disease have made the tree situation at the park “one of the committee’s primary concerns.” According to Steve Dunlap, a spokesperson from the Forestry Division of the Los Angeles Department of Recreation and Parks, 28 diseased or dead trees were cut down at the park. Trask has been working in conjunction with grounds maintenance at the park to increase the watering schedule for the drought-affected trees. She will also work with the L.A. Parks Forestry division to determine the best trees to replace the ones that have died. The irrigation system is the first thing that needs to be addressed. “I’m looking for volunteers from the community who have experience in the landscape or irrigation business who would be willing to donate their time and expertise to examine the current system, give suggestions on upgrades if needed and assist with pricing,” Trask wrote in an Oct. 18 email. PAB member Bob Benton volunteered his gardener, who also works at Hillcrest Country Club. Recreation Center Director Erich Haas said that the park’s senior gardener Marcel Bertrand, who maintains the irrigation lines, is available from 6 a.m. to 2:30 p.m. To volunteer, email Trask at pppremap2013@gmail.com.